Welcome to the Pewaukee High School Visual Art Department. You will find many visual art resources, links to our programs, classes and more. Take a browse and explore. Parent-Teacher conferences are Wednesday, October 8 from 4-7:00 p.m. The arts are vital to all students. Studies have shown that students who study the arts (visual art, music, theatre, dance) score better on standardized tests and are more employable in the 21st Century. For more information on the value of the arts click this link. HOW WILL YOU CELEBRATE? We are nearing the end of our first full month of school and the art department is already involved in many community service projects that benefit the school and greater Pewaukee Community. Look for our work in the following places and spaces! Mrs. Bjork's Drawing 1 class designed the buttons that will be sold during homecoming to promote Pirate Pride. The Student Senate chose the winning two designs. Congratulations to Ayah Abdelsalam and Kaiti Scanlan for their winning designs. ﻿Make sure you buy a button!! Mrs. Bjork's Painting 1 students volunteered to assist the Booster club in painting new Pirate-inspired designs in the concession stand. Watch for these designs soon. Thanks to Liana Jackson, Allison Loth, Allison Rokus and Macey Wolfe for volunteering. Art students will be partnering with the Pewaukee Kiwanis Club to design their 20th Anniversary Beach Party Tee Shirts. Watch for these to come out later this spring. The Art Club will begin refurbishing and painting the PHS Visual Art Gallery space which is adjacent to the cafeteria. Watch for our improvements coming soon! Art Club will also be continuing with more community service including visits to the Nursing Home and more. Click on the Art Club tab for all news related to Art Club. Hey I Wanna See Some Art! There are lots of art galleries within this site. If you click on the class tab at the top a drop down menu will show all the classes we offer in the Visual Art Department. Each of those pages has a gallery of some of the works created by students in the course, (except for those that are new courses). There is also a chart of all the courses offered that may be helpful to plan your art future. If you have any questions or comments about this website please use the form here. 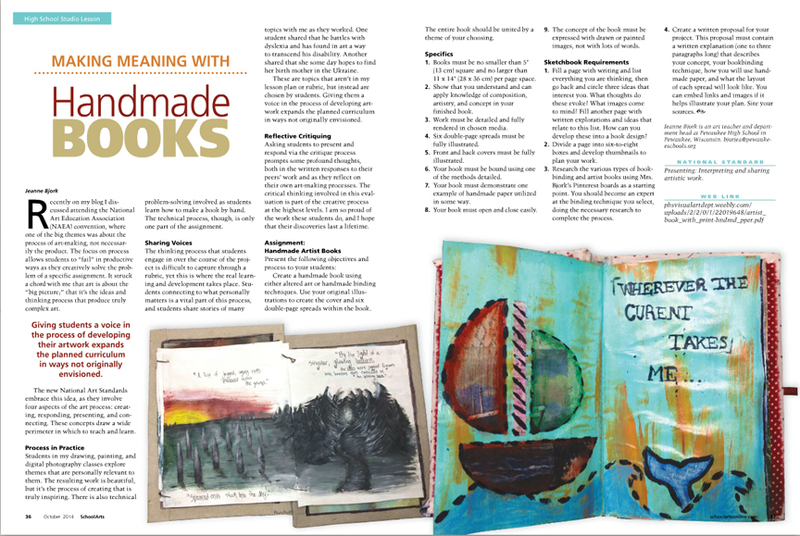 The current issue of Davis Publications' art education magazine called School Arts includes an article written and photographed by Mrs. Bjork, PHS Visual Art Teacher and Department Head. The article explores the work of students in several advanced art classes while discussing how student-led choices make for more meaningful experiences in art. To read the full article click here. Posts to the Art Blog often feature student artwork, students making art and much more. To subscribe click the Art Blog Tab and follow directions in the subscription box. The most recent post had 3 embedded videos showing the latest Animation and Drawing works. As most of you were savoring the final days of summer break, the PHS teachers were participating in an in-service called Discipline Based Literacy. The main premise was increasing the awareness of how we develop literacy in every subject area. Each discipline has unique ways that they "read" and interpret what they read. In the Visual Art program literacy is inherent in all the units we teach. Students communicate visually, but also in written form. The critique process - looking at art, talking about art and writing about art, plays a big role in literacy in the art room. As a team the K-12 Art educators developed the following How We Read Art list. Students will also receive bookmarks to help them remember and posters of these are hanging in the classrooms to help with literacy development. Mr. Lamp teaches Introduction to Art, Sculpture 1 & 2, Second semester sections of Painting 1 , Drawing 1, Art History and one section of Introduction to Digital Media. 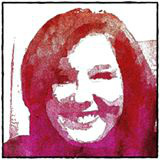 Mrs. Bjork is the department head and teaches First Semester Drawing 1, Painting 1, Digital Photography 1 & 2, Drawing2/Painting2, Animation and Experimental Video, Graphic Design, and Introduction to Digital Media.